Organic meat from a farm in the Peak District is the star attraction at this large back-street local the Lord Nelson, tucked away in the hinterland between South Ealing and Brentford. You can enjoy this and much more in the evening, when the kitchen goes 'gastropub'. 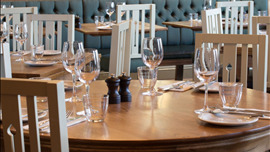 At lunchtime expect basic pub grub, as well as Sunday roasts – all served in a refreshingly traditional setting. The interior is broken up into a number of different drinking areas and there's a separate, family-friendly dining room. Founded by brothers Tom and Ed Martin in 2000, the very successful ETM group have recently added the Ealing Park Tavern to their critically acclaimed portfolio of pubs and restaurants, which also includes amongst others, The Botanist and Chiswell Street Dining Rooms. 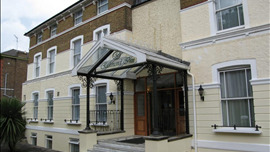 Richmond upon Thames boasts a huge variety of restaurants, wine bars and cafes so in support of all this, The Mobile Food Guide researchers went in search of the best hotel to stay, while enjoying the town's numerous attractions and stumbled across The Richmond Inn Hotel. 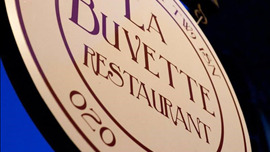 La Buvette is an independent, stand alone bistro in the centre of Richmond set in a pedestrian only area, serving French regional cooking in an informal atmosphere, a congenial fixture of the Richmond restaurant scene, La Buvette occupies a one-time refectory in the shadow of St Mary Magdalene church.